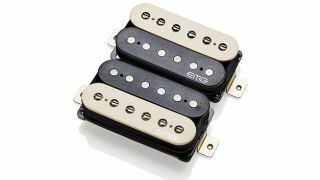 EMG's Retro Active guitar pickups "react unlike anything heard before"
The Retro Active's look is a far cry from the traditional none-more-black EMG finishes. EMG may be best known for its high-output humbuckers, but the company looks set to change that with its new vintage-inspired Super 77 and Fat 55 pickup sets. Promising to update the designs of the past with contemporary technology, both sets use the PAF-style humbucker for their base tone but incorporate a new preamp to deliver a tonal response "that reacts unlike anything heard before". The Super 77 is voiced to bring the grit and edge of '70s rock tones, while the Fat 55 looks to the late-'50s for its sounds. Both sets pair low-impedance outputs with traditional bobbins, windings and pole pieces for what EMG promises is the best of both worlds. The Retro Active Super 77 and Fat 55 are available now for $199 per set from EMG Pickups, and come in black or zebra finishes.